This flavorful, Tom Kha Gai soup is always on the rotation at my house! For a heartier meal, I add a starch on the side, such as roasted winter squash, sweet potato, or white rice. Heat 2 tbsp coconut oil in a large pot over medium heat. Salt chicken on all sides, then place skin down in oil. Let cook undisturbed for 5 minutes, then flip and cook for an additional 3 minutes. Pour 1 cup of broth in the pot and cover. Let cook for 15-20 minutes, until internal temperature of chicken reaches 165 degrees F. Remove chicken and set aside to cool. Trim the ends of the zucchini and chop into rounds, then quarter them. Add zucchini and sliced mushrooms to the pot and let simmer for 5-10 minutes, until soft. In the meantime, separate the chicken from the bones and skin. (Save the bones in the freezer to make broth later on.) Shred or chop it into small pieces, then add to the pot to warm back up. Add the fish sauce, coconut aminos, lime zest, and lime juice. Adjust seasonings as needed. Remove the lemongrass and ginger, then ladle into bowls and garnish with fresh cilantro and slices of thai chili! I sometimes like to use 3-4 drops each of doTERRA Lemongrass, Ginger, and Lime essential oils in place of the fresh lemongrass, ginger, and lime zest to make this dish even easier! 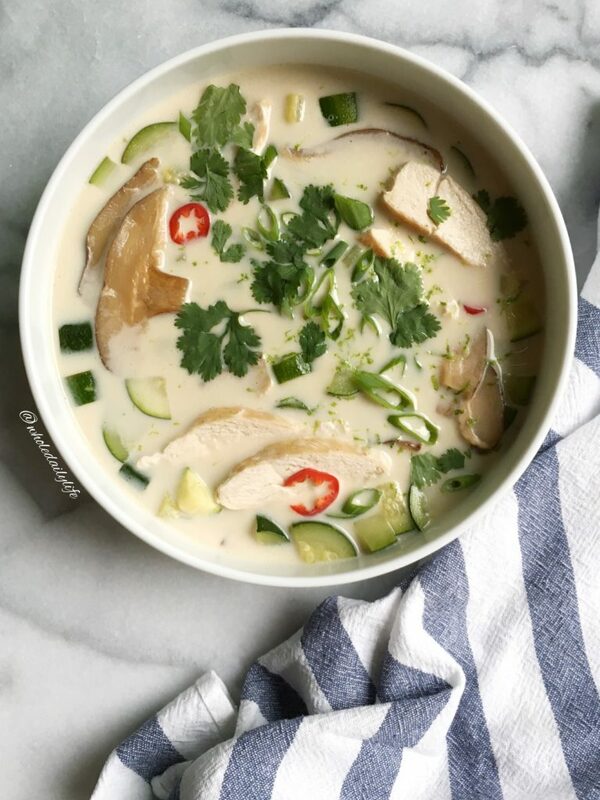 I will also often cook boneless/skinless chicken breasts in my instant pot and shred those to add to the Tom Kha Gai soup instead.